Gosh, where did the time go? It feels like we were just enjoying Wimbledon the other week. And yet here we are, about to dive into a whole new year. Which can only mean one thing: it’s New Year’s resolution time. If you’re a business owner, we’ve had a few ideas about what you could tackle in 2018 that will actually benefit you and your business. Let us know if you think of anything else. First things first: there is no point setting yourself a bunch of arbitrary goals if you don’t know where you’re going. And don’t just say ‘forward’ or something silly like that. You know as well as we do that setting a strong vision at the beginning of the year will motivate not just you but your entire team. So give it some thought. And don’t forget to tell the rest of them or they’ll get very lost indeed. You know you’ve been putting it off. That storage room is a hazard to anyone who dares venture beyond the first stack of archive boxes. It’s time to decide what can be destroyed, what can be scanned, and what can be stored off site. Don’t wait until spring. You’re a business leader – be ahead of your time! Get it done now. You’ll feel smug when March rolls around. You know what it’s like when you’re just getting your head around the latest P&L forecast, and suddenly: ping! You’ve got an email. It’s from Susan in HR, and judging by the shouty capital letters in the subject line she doesn’t sound pleased. Notifications are the enemy of productivity. Turn them off. That means social media too. If Susan needs you that urgently, she can come and talk to you in person. We don’t mean to sound like your mum, but are you getting enough rest? And decent food? You won’t be particularly productive if you’re running on empty you know. And no, coffee doesn’t count. Get a sandwich into you! And go eat it outside. We don’t care if it’s cold, that’s what coats are for – you need a screen break. This is super trendy at the moment, so if you’re looking for good boss bonus points then this is the way to go. It’s actually a win-win staffing strategy too. Your team will be less stressed and more productive if they can work hours that suit them better, and you’ll attract more (and potentially better) candidates when hiring. Plus it’s an excuse to knock off early on a Friday, which is always nice. Another worthy cause, and a tick on the environmental responsibility checklist. Again though, this is not just about looking good. Going paperless – by switching to a digital filing system, for example (less-than-subtle plug: we can help with this) – will actually save you time and money. So everyone is happy. Except maybe your stationery supplier. Finishing with a corker, aren’t we? No matter how big your team, there are probably jobs you do that someone else could do just as well, right? Perhaps even better? Sitting at your desk until 8pm every evening doesn’t make you successful, you know. It makes you tired. And grumpy. Just ask your PA. 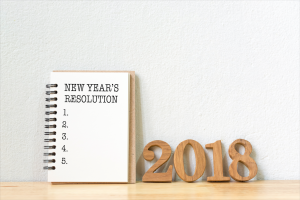 If you’ve got a goal for 2018 that we can help with, drop us line. Or come and see us. We might even let you have some of our left over Quality Street. See you soon!